The promised Part 2 of the analysis of get-rich-quick advertisements in my local paper will appear next week. I made an executive decision that the highest priority thing to do with this site was to get it back onto a regular weekend update schedule. This means that the new content this week will be a bit thin. Now that the office move is complete, all the furniture has been assembled, the computers have been reconnected and the books are back on the shelves I can go back to a routine of working during the week and hobbying at weekends. Which is the way things ought to be. I don't know who Yuri is, but he sent me a lovely religious card. Well, the card was lovely as was the thought, but the story on the card would have not been out of place in the old Twilight Zone television series as it was a horror story featuring one of mankind's greatest terrors. I don't think I will be converting because of the card, but I might be a bit careful who I get to help me escape from prison if I the need ever arises. You can see the card here. I sometimes think that people run out of things to complain about so they have to invent problems. A free magazine in the US has received thousands of complaints about a picture on the cover. This picture was so disgraceful that women hid the magazine from their husbands lest the husbands be driven into paroxysms of lust and debauchery. The cover had to be hidden from children in order to protect them from corruption. The moral fibre of the nation was being threatened. We are all adults here, so I have decided to make the picture available to those who believe that they might have the ethical and moral strength to resist temptation, but, just in case, I have hidden it and you will have to put your mouse over it to see it. Please do not look if you think that looking might endanger your soul. You have been warned! I should be so ashamed that I have offended people with what I had to say about a multi-level marketing scheme going down the drain. What was I thinking when I laughed about Omegatrend calling in the corporate undertakers? Well, what I was thinking was that there is now one fewer scam for innocent people to lose money to. Someone did not agree with me. The National Museum of Kenya is blessed with one of the finest collections of hominid fossils in the world, which is in no small part due to the work of the Leakey family who have been researching humankind's ancestry in that part of the world over decades. It is awesome to think that in one place it is possible to see the development of humans over millions of years. Of course, it depends on your definition of "awesome". If you use it in the colloquial sense, as it would apply to me and I hope to you, it means inspirational and challenging. To some, however, it means frightening, especially to those who would deny the way that the evidence of the fossils points inexorably towards an an ancient earth and ancient inhabitants. If you fell into the second category, how would you deal with the existence of the fossils? What you could do is demand that they be hidden from the public, lest the public start to believe their eyes and doubt some myths. This is just what some church leaders in Kenya are demanding, as if hiding the fossils will make the truth disappear. I hope that the museum can resist this attempt to corrupt its purpose and reduce its ability to educate and inform its visitors. Someone didn't like what I had to say last week about Truehope, the pack of Canadian crooks who appeared before a judge who was insane enough to need the psychiatric help that their quack remedy could never provide. This someone (almost) anonymously wrote to me in the following manner. I wonder who it could be. Good News for complimentary and alternative healthcare. The first thing I noticed (after noticing the gutless anonymity of the writer) was that it was good news for free medical care. Isn't that what "complimentary" means? I had a look at the page in the link and I saw that CTV were being sued for both libel and defamation. I always prefer it when kooks say they are going for the trifecta of libel, slander and defamation because the acronym LSD reminds me of the delusional state of that which passes for minds in kooks. If you wonder what the suing is about, it is about a television show in which the head honcho at CCRG was shown to be a liar and a blowhard. You can see the show here. There has been a resurgence of Gutless Anonymous Liar activity over the last week or two, but enough is enough for this week's update. I have received several electronic greeting cards and some other collected drivel, but I will save them for later. Just as I will the promised Part 2 of the examination of money-sink advertisements in the local paper. A correspondent has pointed out that one of the mystery "opportunities" which was keeping its details secret was Herbalife, so that makes at least two different versions of the same scam in the same set of advertisements. And if you want to know why I do what I do, it's so that people don't need to write to me to say "I just wish I had found your website before I found theirs, as I blew six grand on this B.S.". It is very rare for authorities to act against sellers of snake oil, but someone finally has. The Australian Consumer and Competition Commission has commenced action against a company called The Menopause Institute of Australia. You can read the media release from the ACCC here. In this news item about the story it mentions that the man behind the Menopause Institute seems connected to another person who runs male impotency clinics, was prosecuted recently for misleading and deceptive conduct in their advertising and who was also found a few years ago to be importing unregistered drugs into Australia. Am I surprised by these connections? Not really. Most politicians can be expected to stay away from any subject which might offend potential voters and to exhibit vacillation when it comes to anything controversial. The previous Minister for Education and Science in the Australian Federal Government, Dr Brendan Nelson, managed to score a record number of nominations for the Australian Skeptics' Bent Spoon Award by a silly statement which seemed to offer support to the disguised creationism misnamed "Intelligent Design". Dr Nelson is an intelligent man and I don't think for a moment that he would believe anything as silly as ID or not be able to see it for what it is - an attempt to disguise superstition as science. He was acting as a politician at the time and showing "balance". 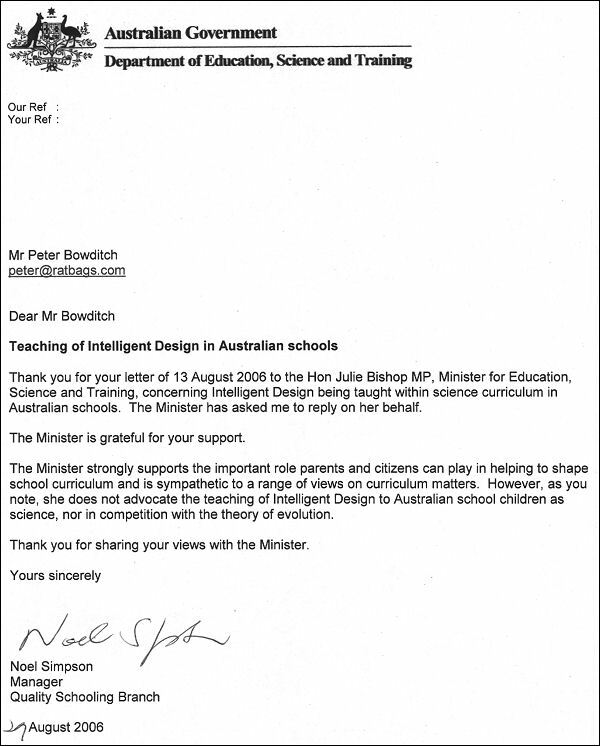 It is very good to see that Dr Nelson's successor in the portfolio, Julie Bishop, has come out unequivocally against the nonsense and has declared that there is no place for the rubbish in the nation's science classrooms. And she has such an appropriate name for the headlines about this, too. See the story here. I would like to personally thank and congratulate you for your comments about the teaching of religion disguised as science in the nation's schools. The farce of "Intelligent Design" has no place in any course where it might be seen as any sort of legitimate scientific hypothesis, although it would be totally appropriate to examine it in a course on the philosophy of science where it could be lined up with astrology and other examples of unscientific thought. If people want to teach religion to children it should be done openly and honestly and not be used to subvert other areas of human inquiry or pretend that it is something it is not. Again, thank you and congratulations. I expect that you will be the recipient of some well-organised letter writing campaigns over your comments. Ignore them. Religion has its place, but that place is not in science classes. Get out those old crystal radios or maybe even one of those new-fangled valve contraptions and get ready to listen to radio 4BC in Brisbane between 7:30 and 8:00pm on Saturday, August 19, when I will be on the wireless with Loretta the Jelly Bean Lady. We will be talking about quackery. If you can't find your radio set and the one in the car is broken or if you live somewhere other than Brisbane, Australia, there's this amazing thing called "the Internet" where you can point your computer to www.4bc.com.au and listen through the speakers on your desk. If you live somewhere which has a different time to Brisbane you can go to www.timeanddate.com/worldclock/ to find out when to listen. The article I have been writing about suspicious advertisements in my local paper is finished, and you can read the whole thing here. The second part didn't require as much work as I had anticipated because several of the advertisements were for Herbalife, although none of them got round to mentioning this small fact. Not even the one which described itself as "ethical". I get the occasional email asking about the random quotes from famous people which appear in a few places on this site. I have gathered them all together and you can see the collection here. I was on the radio on Saturday, August 19, venting about health fraud. You can listen to the program using the slider below. My plans for the week are in chaos as well because I was supposed to have my horoscope cast on Wednesday at 11:12 am. The timing was determined by my last horoscope, so that will probably have to be revised before I can adjust my calendar and change the appointment time. Life's never easy, is it? I hope that the recasting doesn't give me a new set of Lotto numbers for the weeks when I didn't win anything. It would be terrible to look back and see that predictions for the past had come true but I hadn't known about them until after the event. It is almost an article of faith for alternative medicine supporters that real doctors can do whatever they like and will never be disciplined but the orthodoxy is right there to suppress and destroy any competition who offers an alternative. The fact that there are procedures for reporting problems with real doctors but the only recourse available for anyone hurt by a quack is through the courts is glossed over. The fact that there are systems for reporting deaths in hospitals and adverse drug reactions but no comparable systems for tracking problems with magic herbs is either ignored or lied about. All I have ever asked for is that everyone claiming to treat disorders of the human body be treated the same - claims must be backed by evidence and legitimate research, and problems must be identified, recorded and addressed. Sometimes the system for real doctors does break down, and it is a testament to the efficacy of the regulation process that it makes news when someone slips through the cracks. A case of this has been running through the courts in my city for the last few weeks. It involves a doctor who has been found guilty of performing an illegal abortion. Abortion has had a de facto legality here for some time (a doctor just has to certify that the procedure is necessary for the health of the mother), so it seemed a bit strange that someone should be before the courts for this today. It turns out that this was the only way to get this doctor away from victims, and because the foetus was actually born alive in this case the authorities could not fail to act and had the opportunity to do something. After the conviction was recorded it was possible to reveal that this doctor had been sued by patients in the past, with several being awarded damages, and had been the subject of several disciplinary actions related to improperly conducted abortions. The reason that this was not revealed sooner is that the criminal justice system restricts the ability of prosecutors to inform judges and juries of prior misconduct. As I said, I want all people offering medical advice and services to be subject to the same rules, and I want those rules to include transparency about registration, qualifications and disciplinary action. If a real doctor is behaving badly, through incompetence, ignorance or going over to the dark side, I want them in the stocks next to the cancer quacks and energy medicine charlatans. When I was trying recently to find out the licence status of a qualified medical doctor who was promoting quackery I was amazed to find that there is no public record of registered medical practitioners in my state. If lawyers can't avoid a public record of who is licensed to practise as a solicitor then I can't believe that there is any legal barrier to a public database of doctors. It gets worse when you find that a doctor can be subjected to a continuous stream of validated complaints but nobody can find this out without a court order. Did I mention that this particular doctor has been allowed to continue hacking at women's insides until an appeal is heard? It's a disgrace. Pluto is no longer a planet. This decision by the International Astronomical Union has caused consternation in many parts of Earth, one of the remaining planets. One rather ridiculous question posed by someone pretending to be a journalist was how this would affect the current NASA New Horizons mission to the ex-planet, but it seems that NASA have decided that it would be a bit of a waste of money to turn off the lights and the computers and tell all the New Horizons staff to go home and wait for their next assignments. There has been mention of the political incorrectness of the term "dwarf planet", although "vertically challenged planet" doesn't sound quite right either. Others have commented on Gustav Holst's foresight in not having a Pluto movement in his Planets suite, a predicting ability which is somewhat tempered by the fact that he wrote The Planets in 1917 and Pluto wasn't discovered until 1930. It is rather embarrassing, then, for British composer Colin Matthews who fixed the apparent oversight in 2000 by writing a Pluto addition to Holst's original work. Isn't he looking a bit silly now? The following email was sent to me and several people whose email addresses indicate that they might be in the Nonsense Juice business. Should I trade my principles for some foreign exchange and contact a wholesaler for pricing? What is the best way to get a pallet of wellness to Ghana? Does the buyer have a MasterCard? What is a skeptic and debunker to do in the face of such an opportunity? Someone seems concerned about my comments about Benny Hinn. The subject line of the email indicates that I probably don't need to take too much notice of what Judith thinks, if, in fact, she can think at all. My good friend Richard Saunders from the Mystery Investigators and Australian Skeptics has resurrected The Tank, an Internet radio program that we used to take part in some years ago. The second edition of the new season featured a shy, retiring web site owner who just happens to wear bright shirts and sound like me.